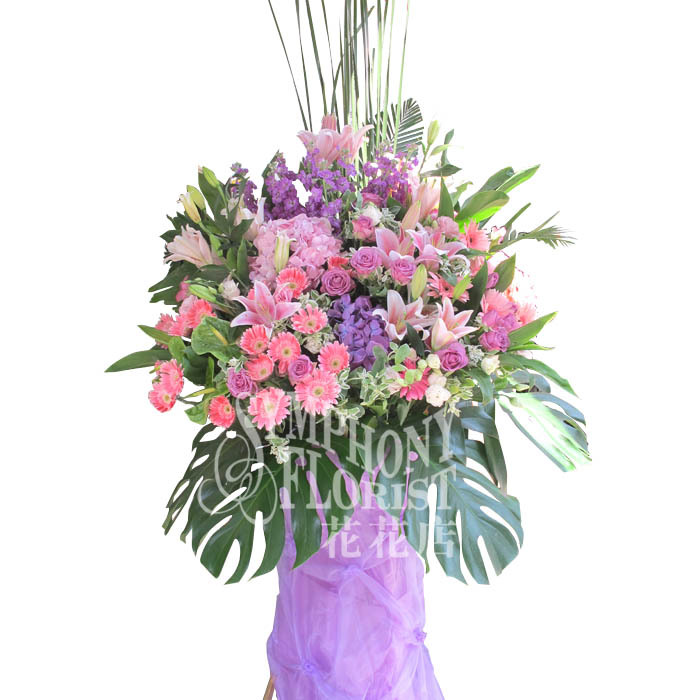 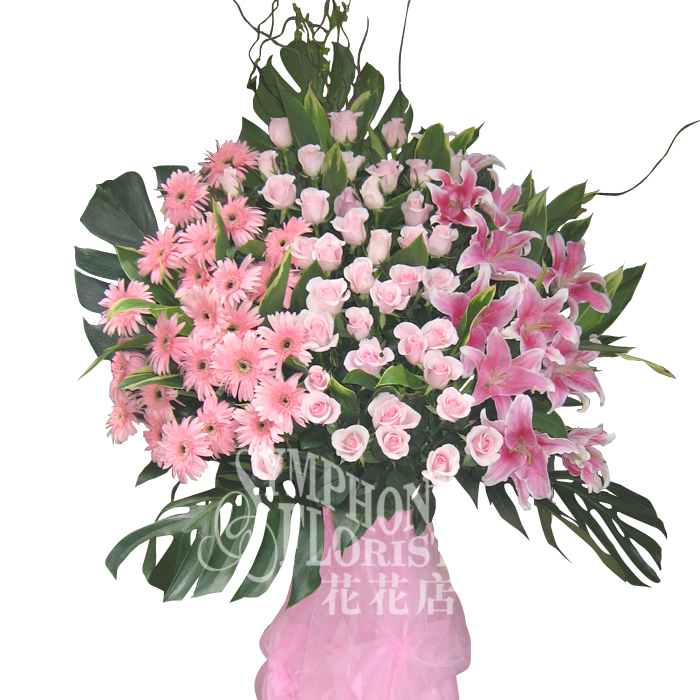 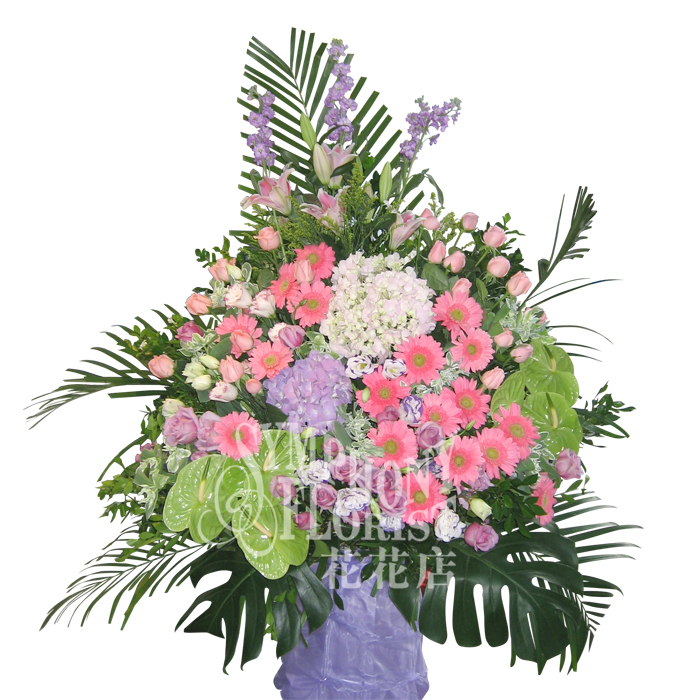 Description: Matthiola, Pink Lily, Hot Pink Gerbera, pink Roses & Greenery. 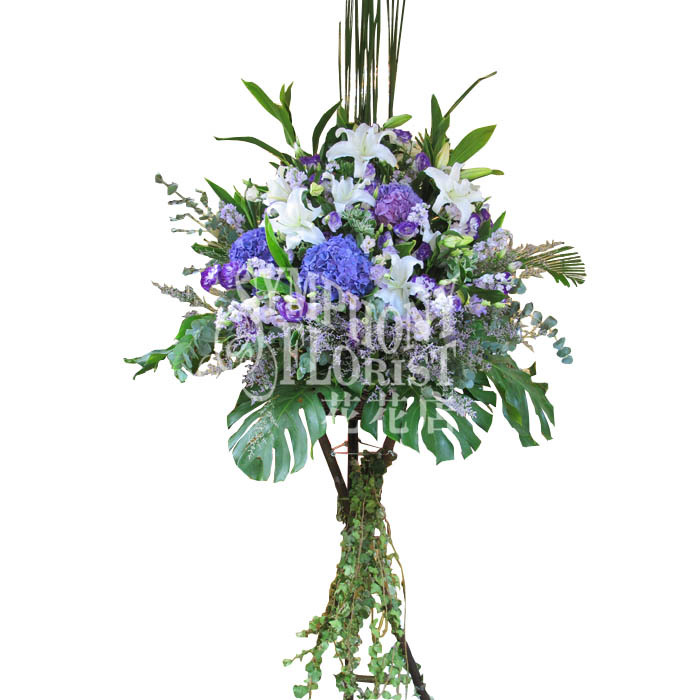 H"180cm, W"140cm. 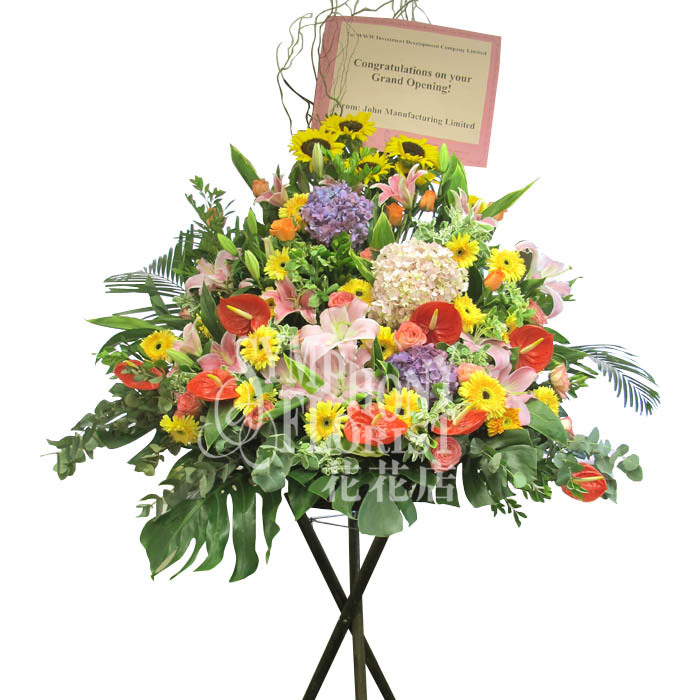 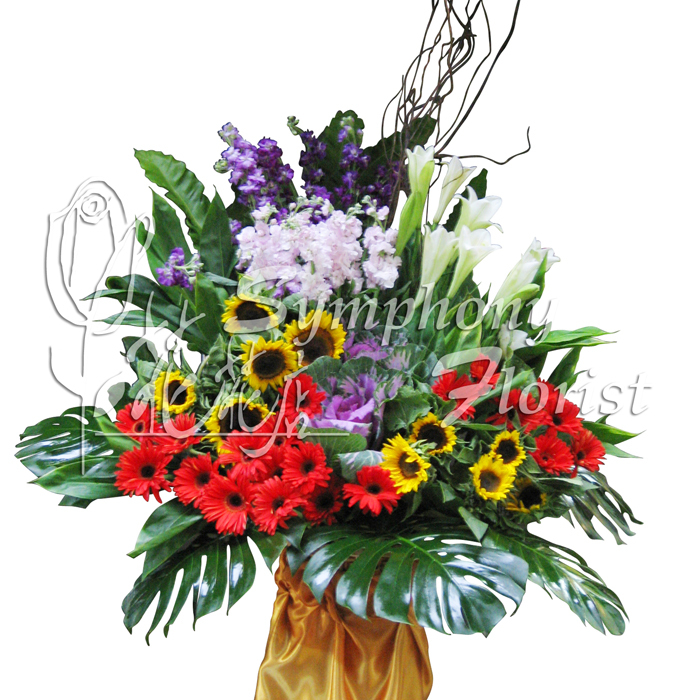 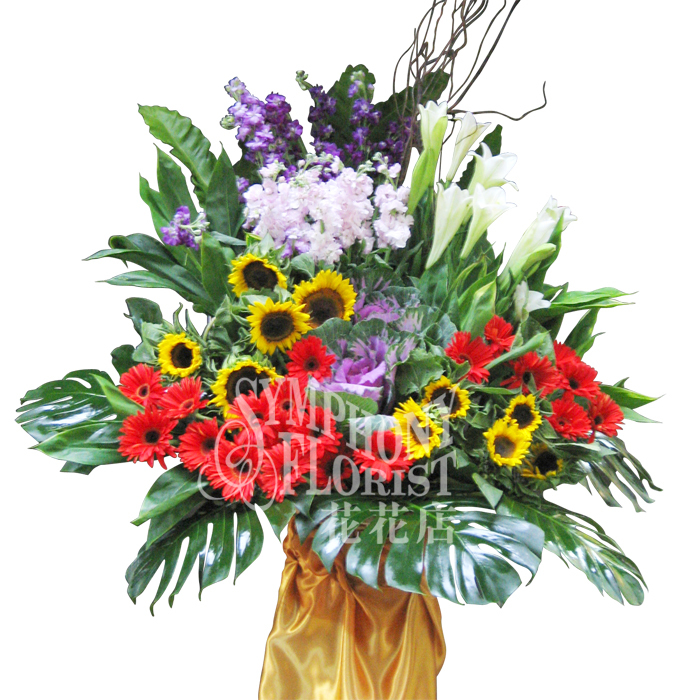 Description: Matthiola, Sun Flower, Red Gerbera, Single Lily, Eustoma & Greenery. 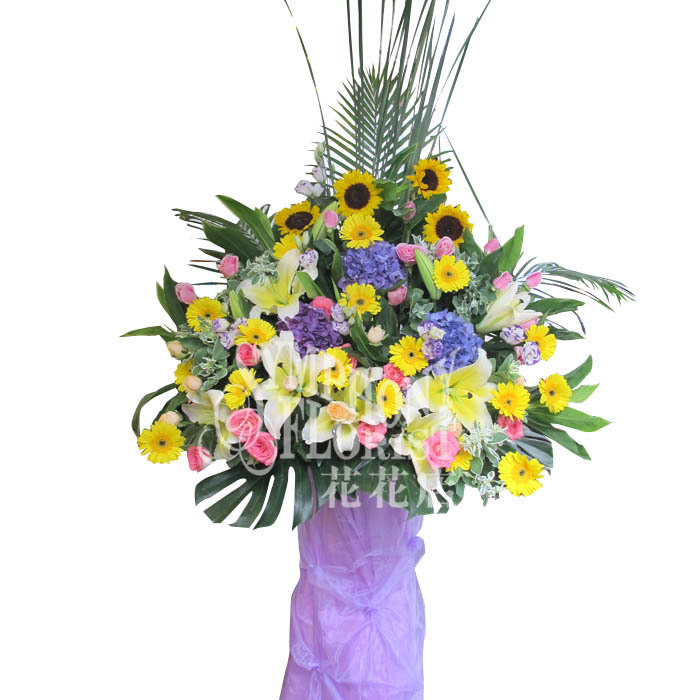 H"190cm, W"150cm. 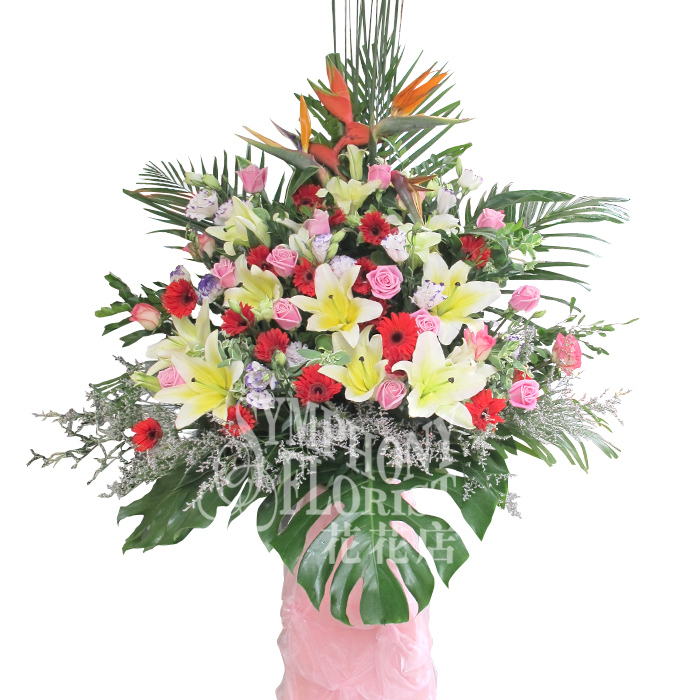 Description: Hydranges, Matthoila, Lily, Roses, Gerbera & Greenery. 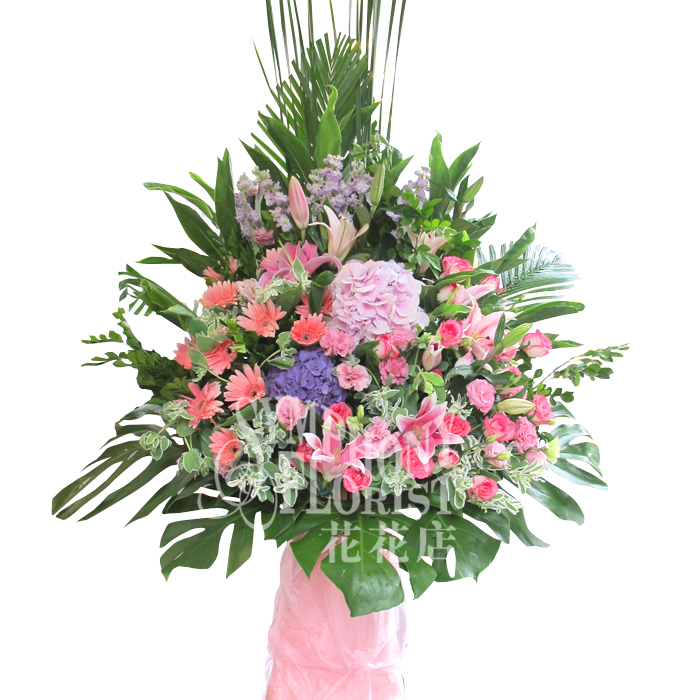 H" 190cm, W" 160cm. 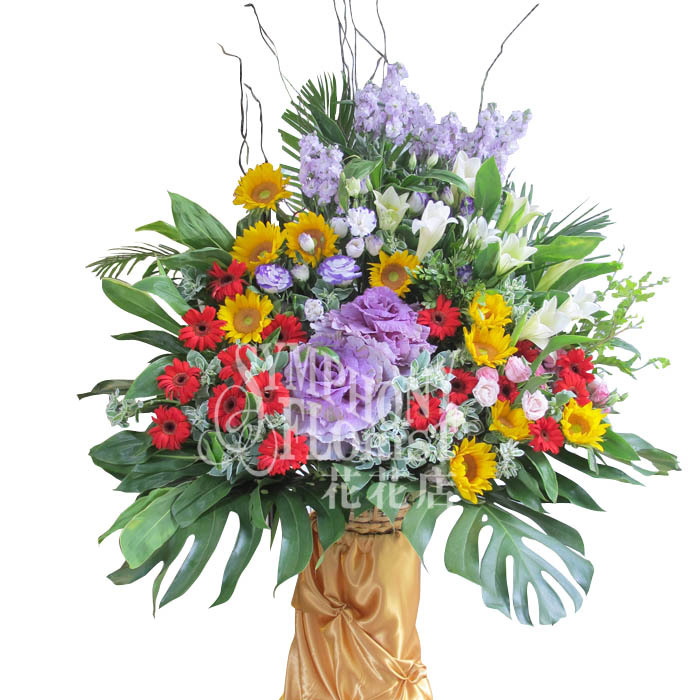 Description: Matthiola, Single Lily, Sun Flower, Red Gerbera, & Greenery. 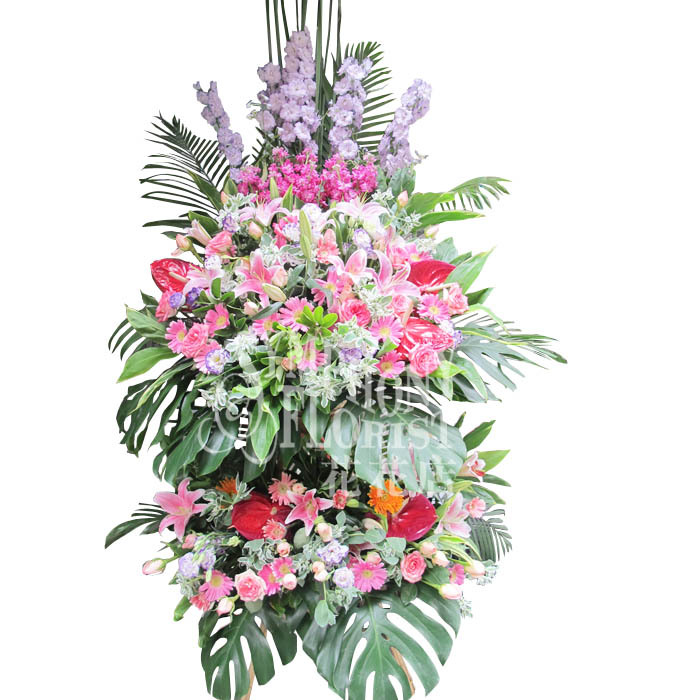 H"190cm, W"150cm. 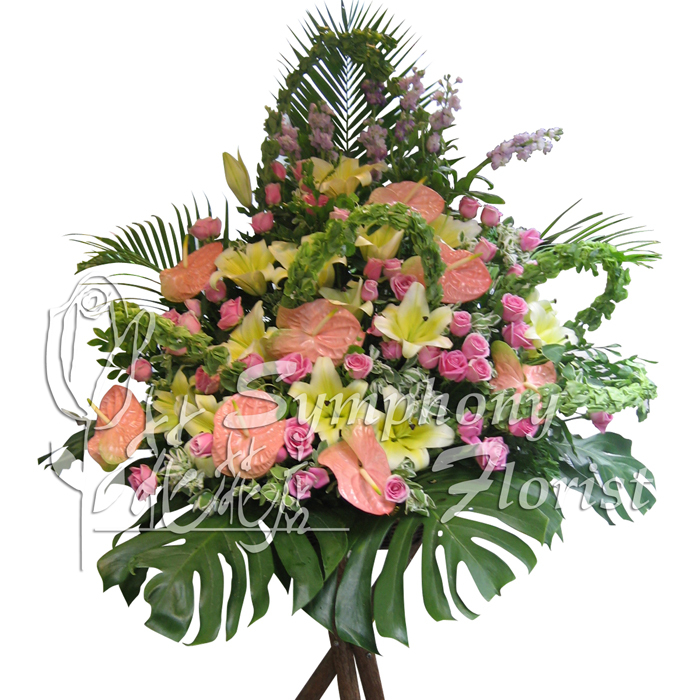 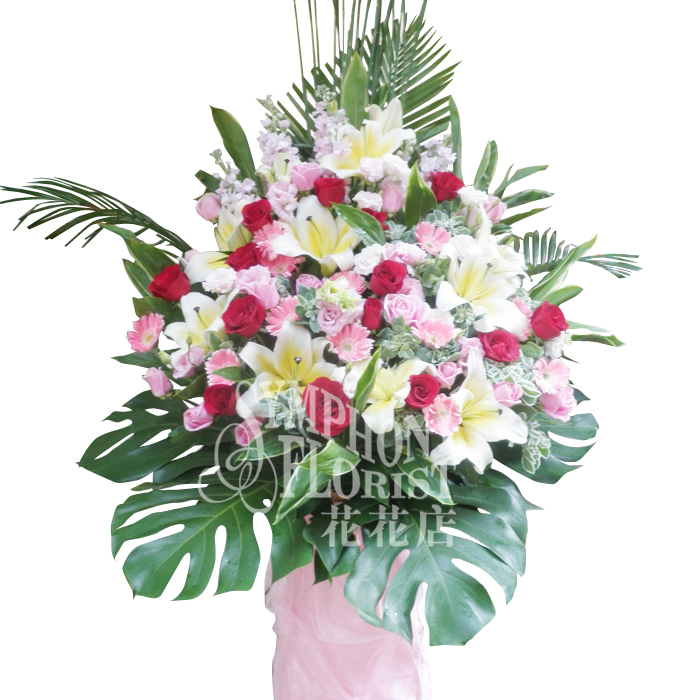 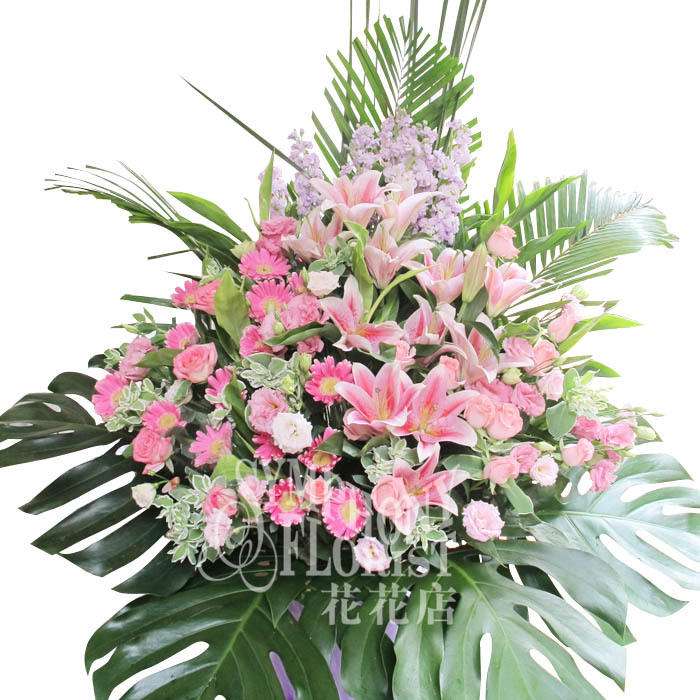 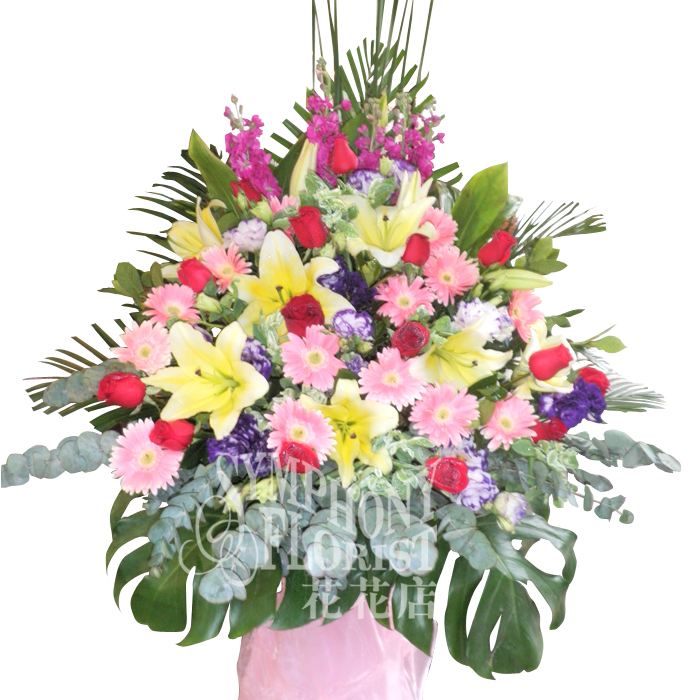 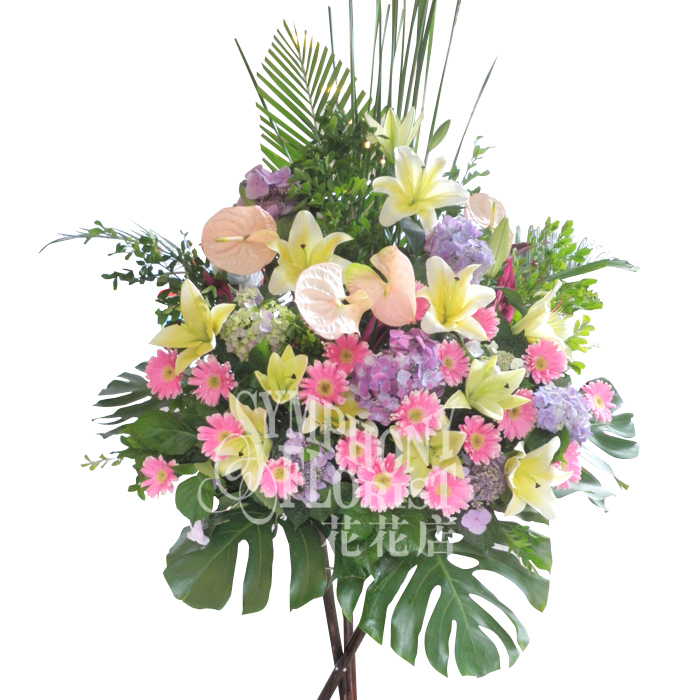 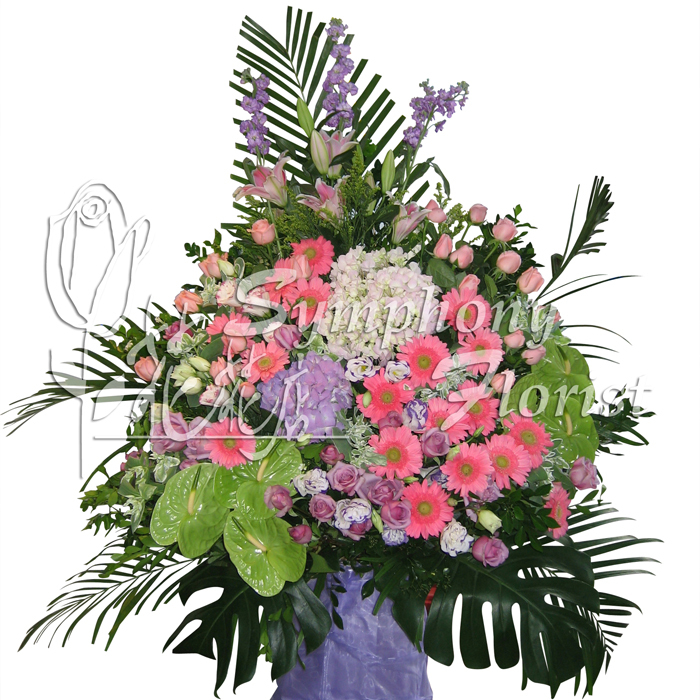 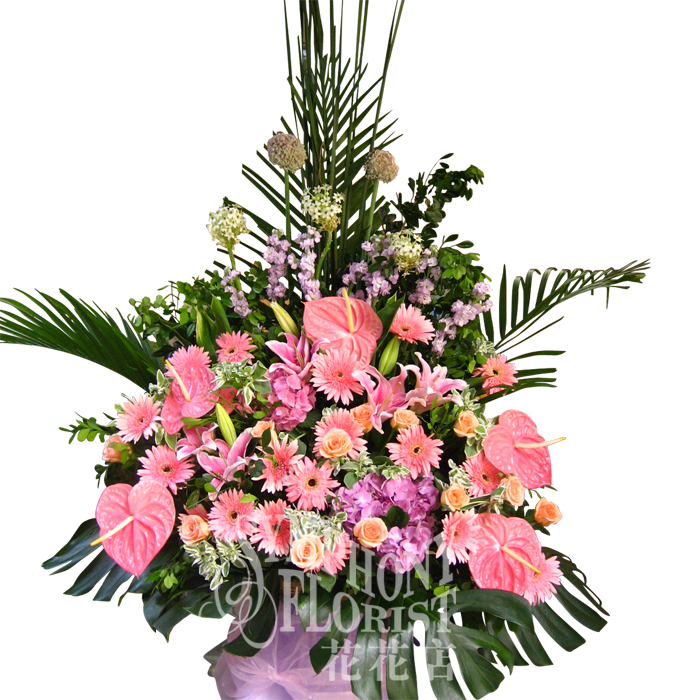 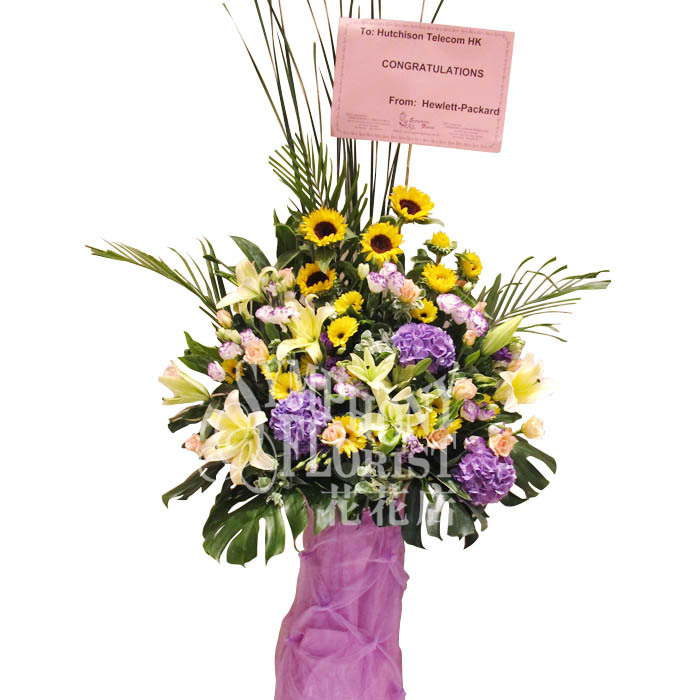 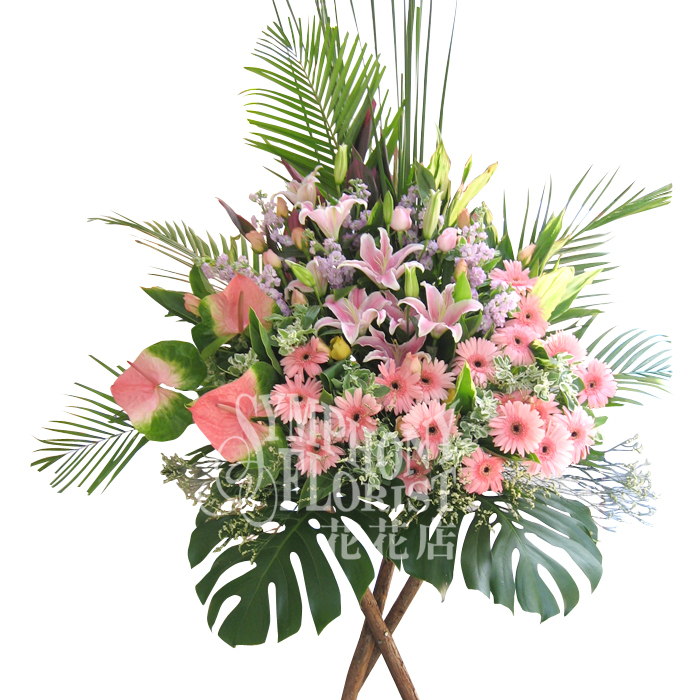 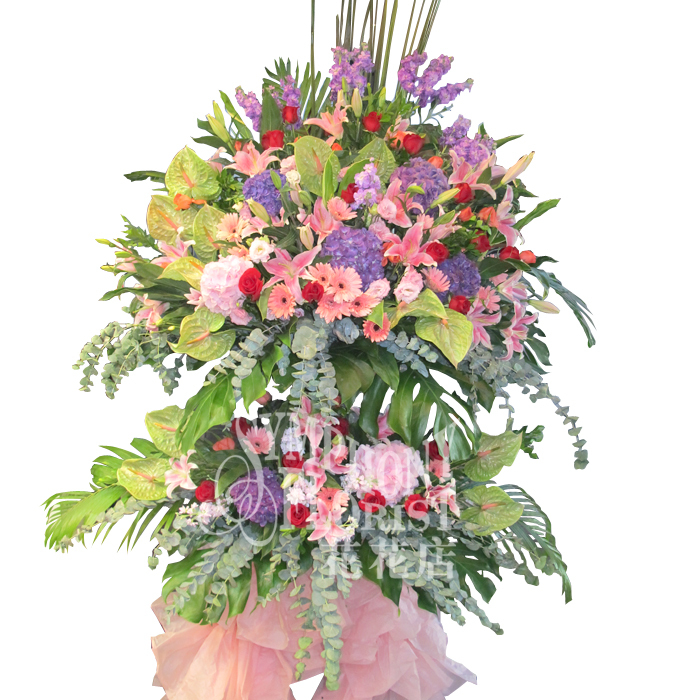 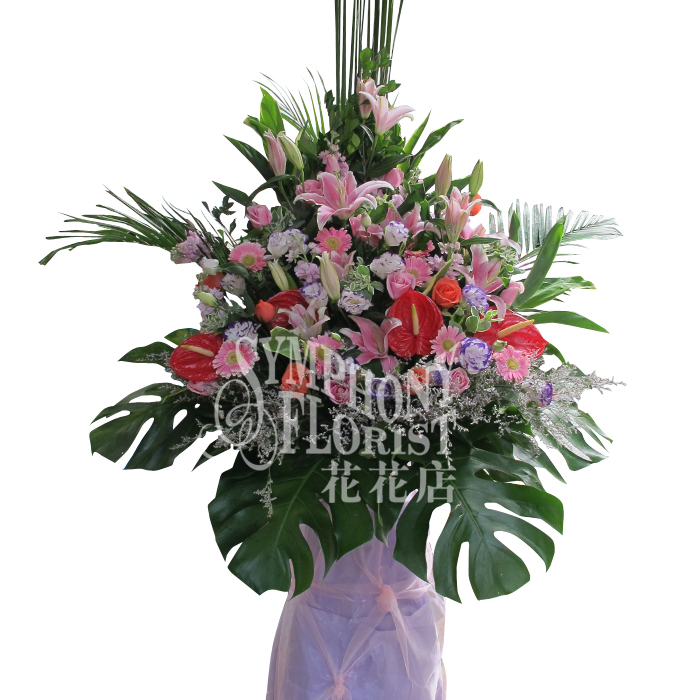 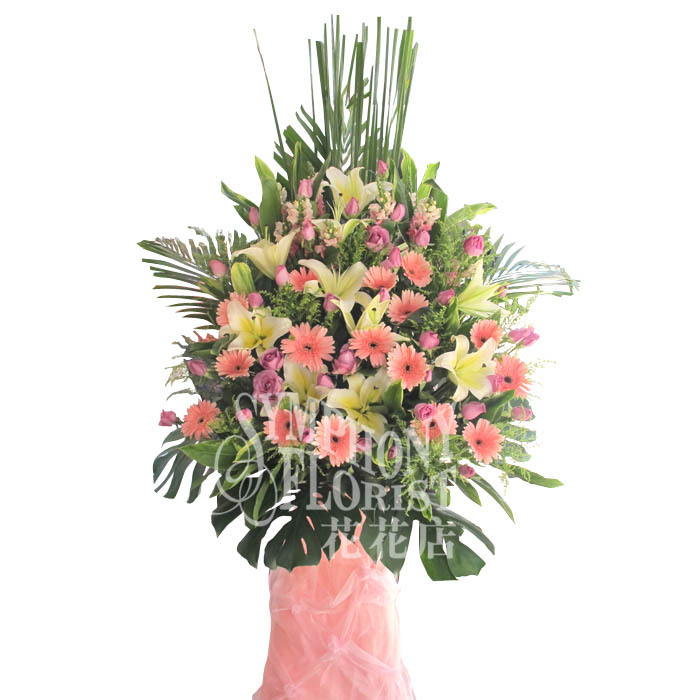 Description: Pink Anthurium, Yellow Liy, Pink Roses, Matthiola, Eucalyptus, Moluccella & Greenery. 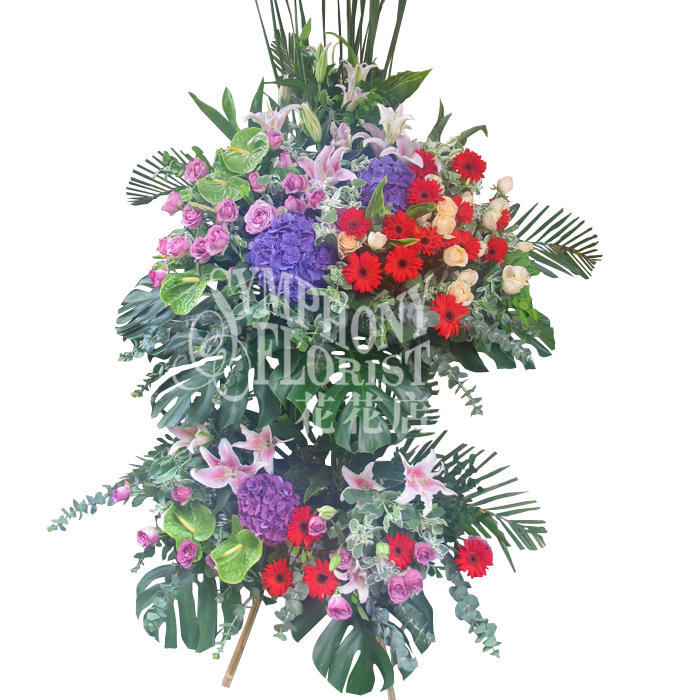 H"190cm, W"150cm. 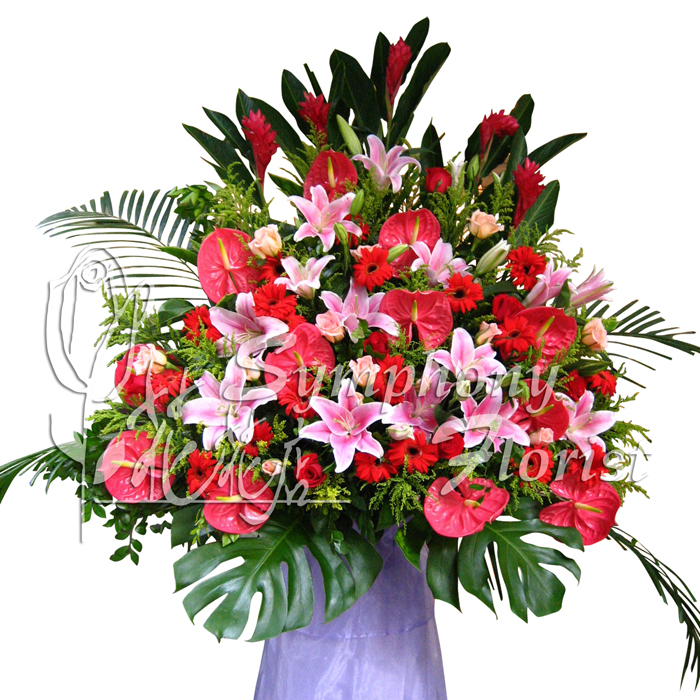 Description: Bird of Paradise, Red Anthurium, Pink Lily, Red Gebera, Red Roses & Greenery. 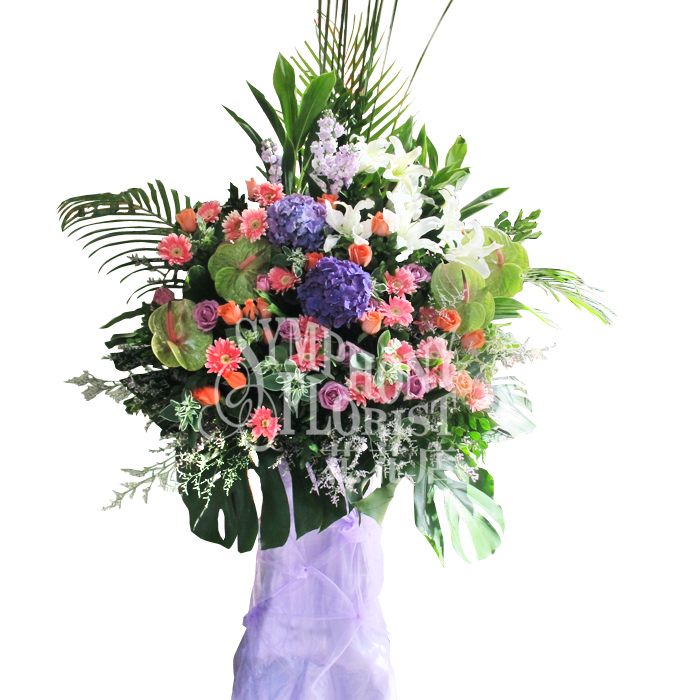 H"180cm. 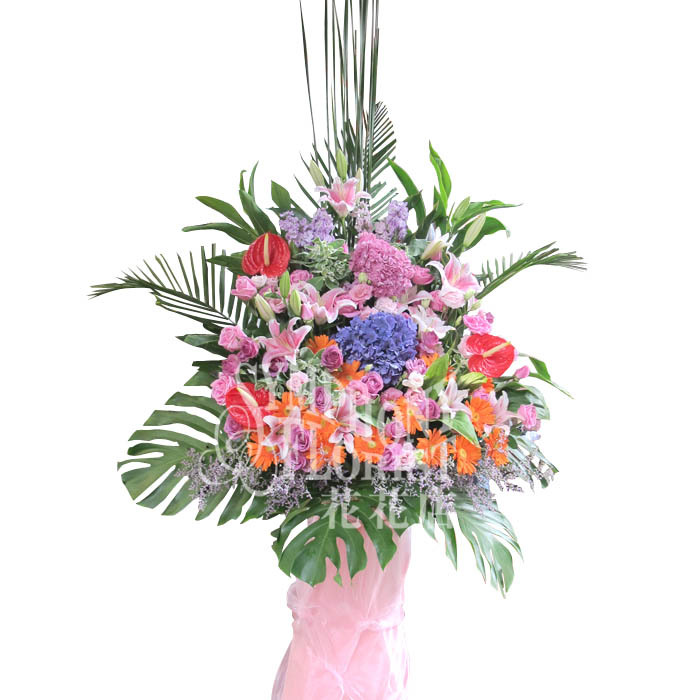 W"145cm. 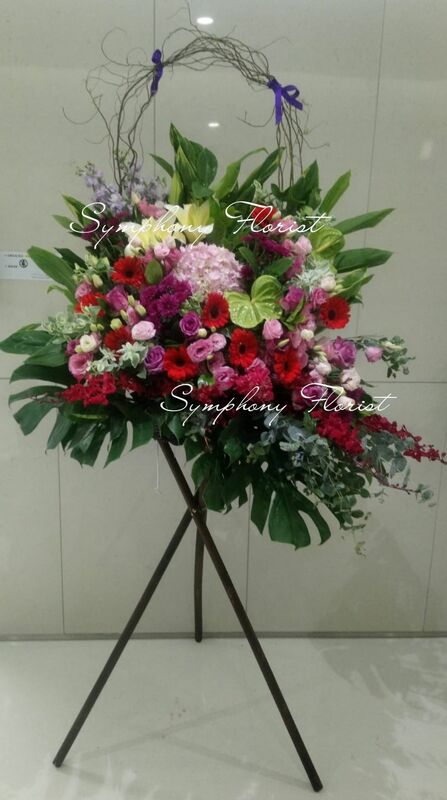 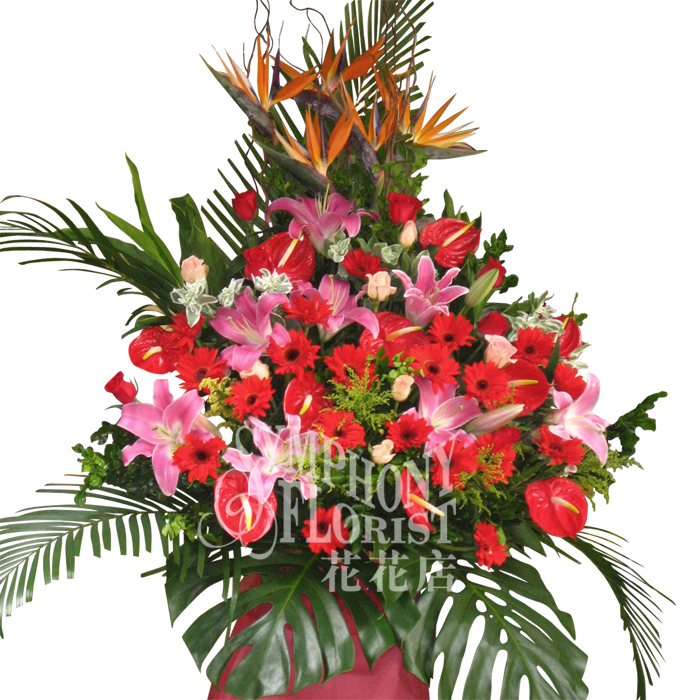 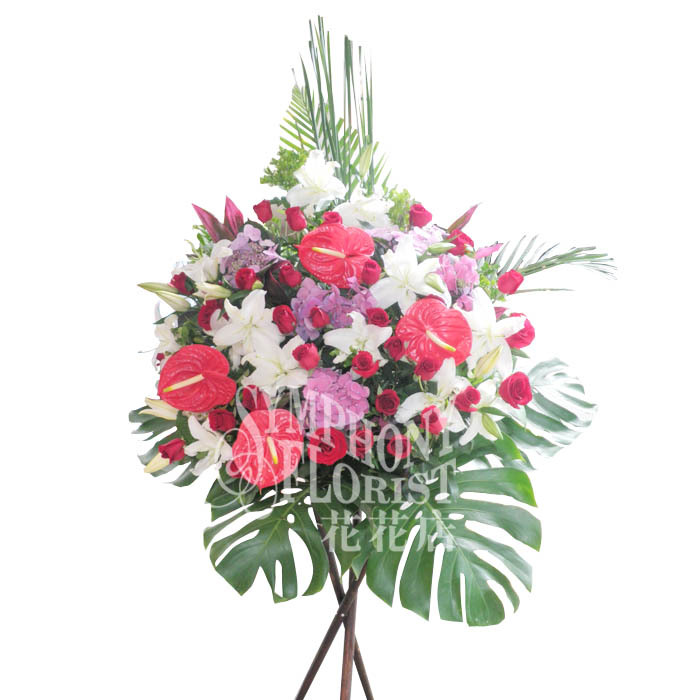 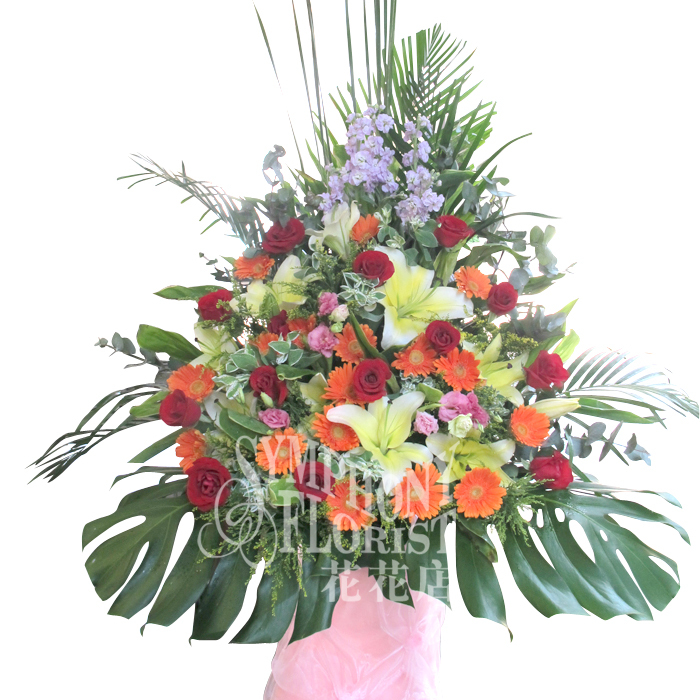 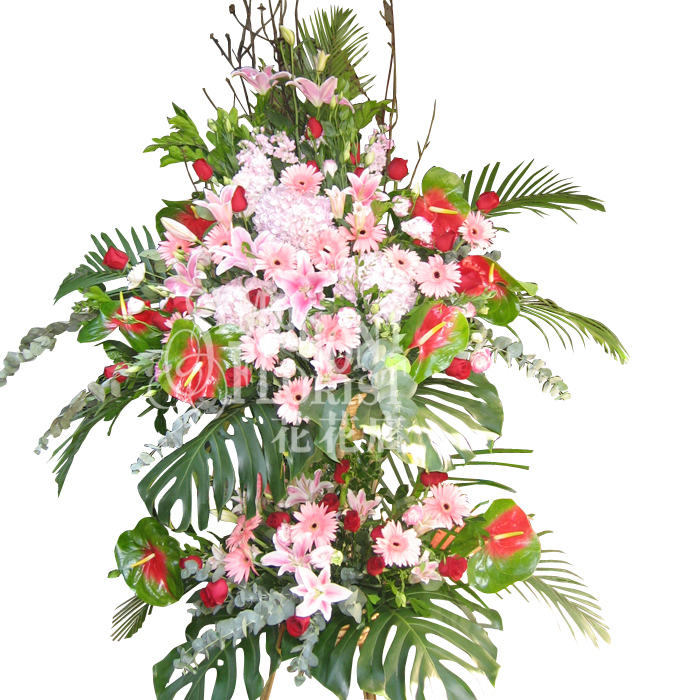 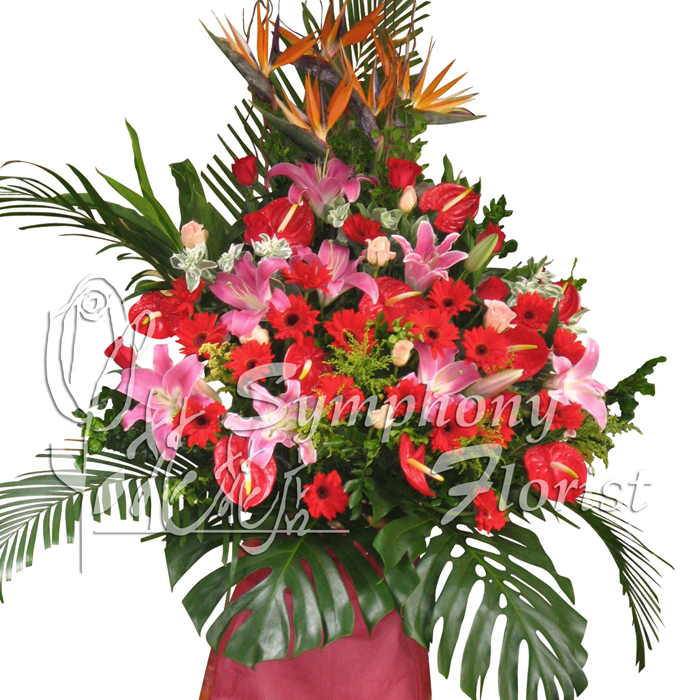 Description: Celosia, Red Anthurium, Pink Liy, Red Gerbera, Red & Champange Roses , Greenery. 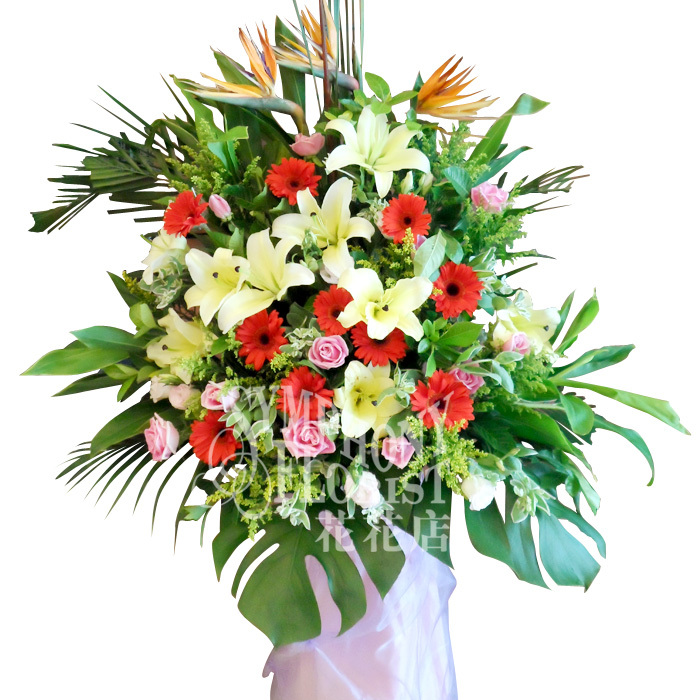 H"190cm, W"150cm. 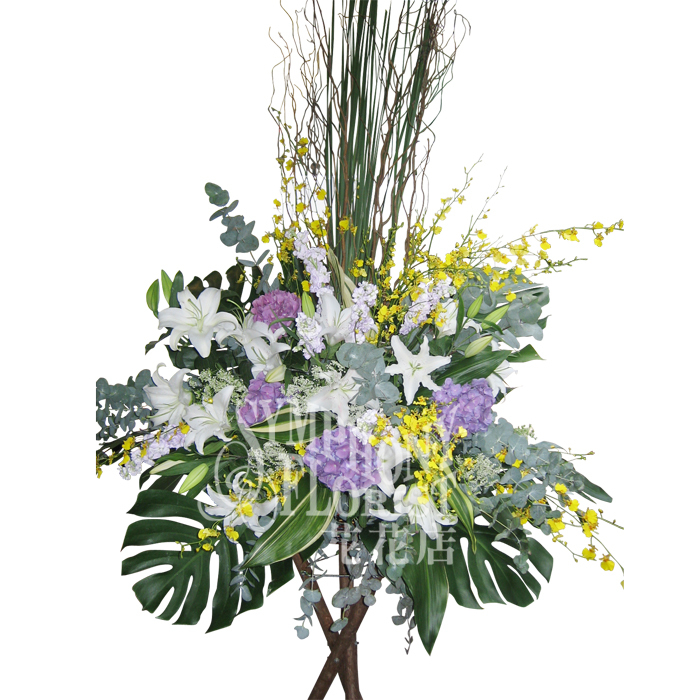 Description: Hydranges, Lily, Eustoma, Eucalyptus & Greenery H" 190cm, W" 160cm. 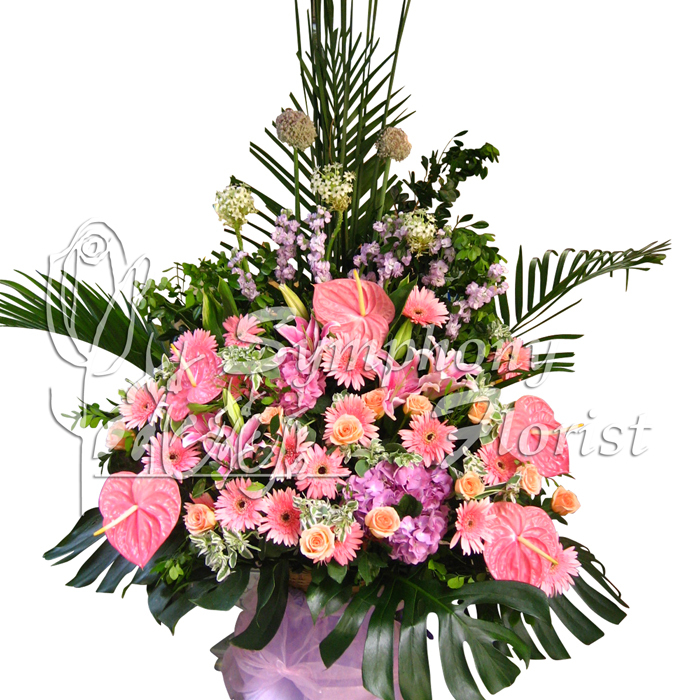 Description: Dancing Orchid, Hydranges, Casablanca, Eucalyptus & Greenery. 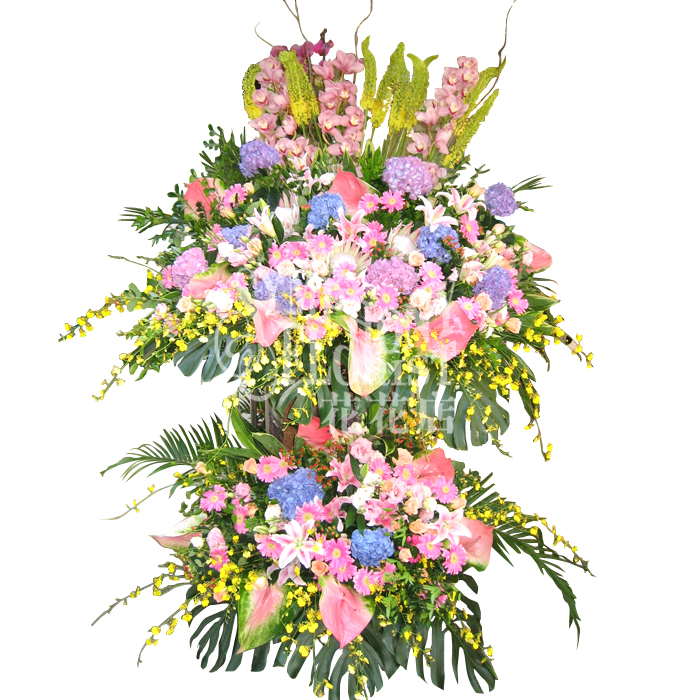 H" 200cm, W"150cm. 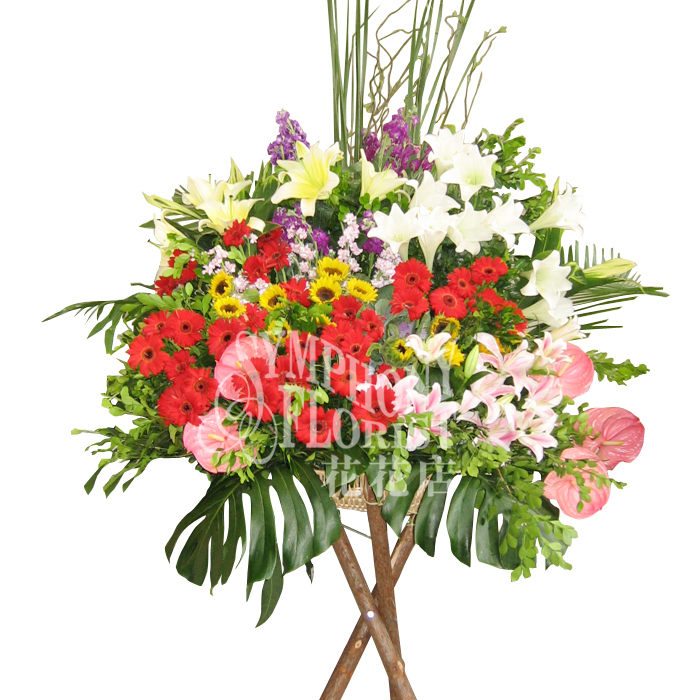 Description: Hydranges, Dancing Orchid, Anthurium, Moluccella, Matthoila, Lily, Gerbera, Roses & Greenery. 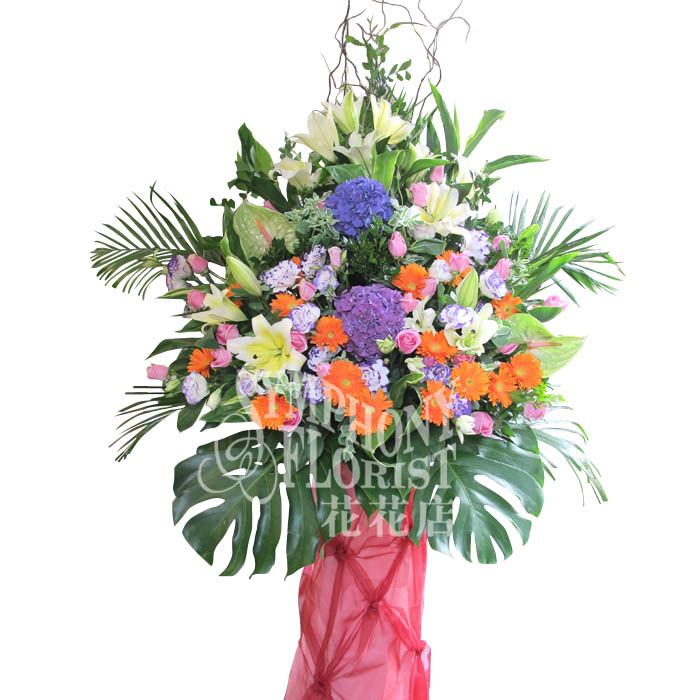 H"210cm, W"160cm. 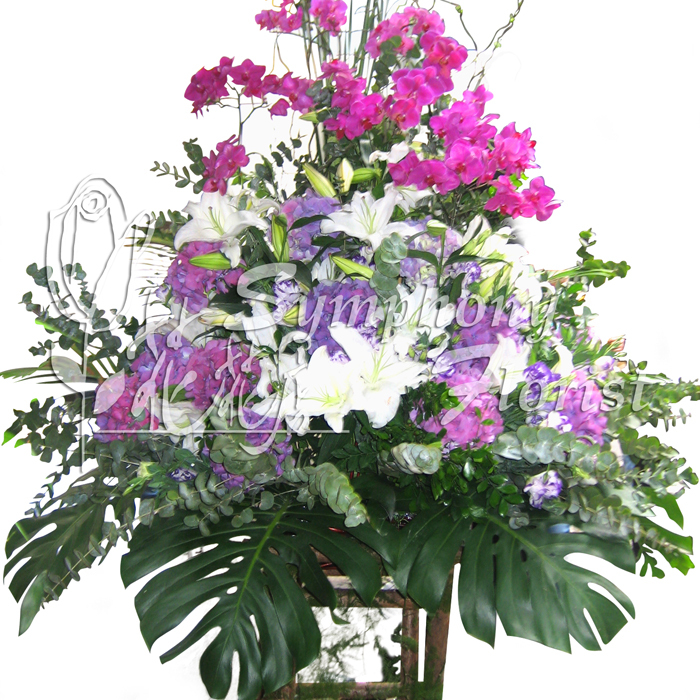 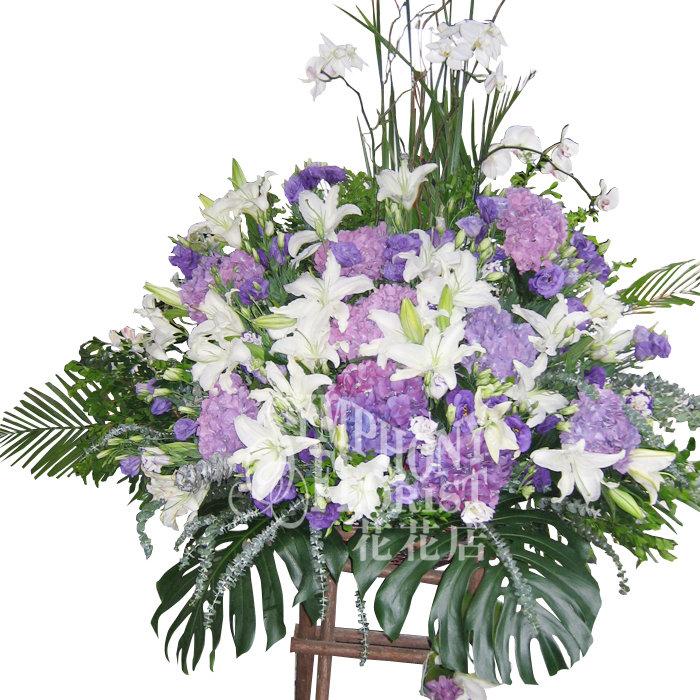 Description: Phalaenopsis, Hydrangeas, Lily, Eustoma, Euphorbia, Eucalyptus & Greenery H"220cm, W"160cm. 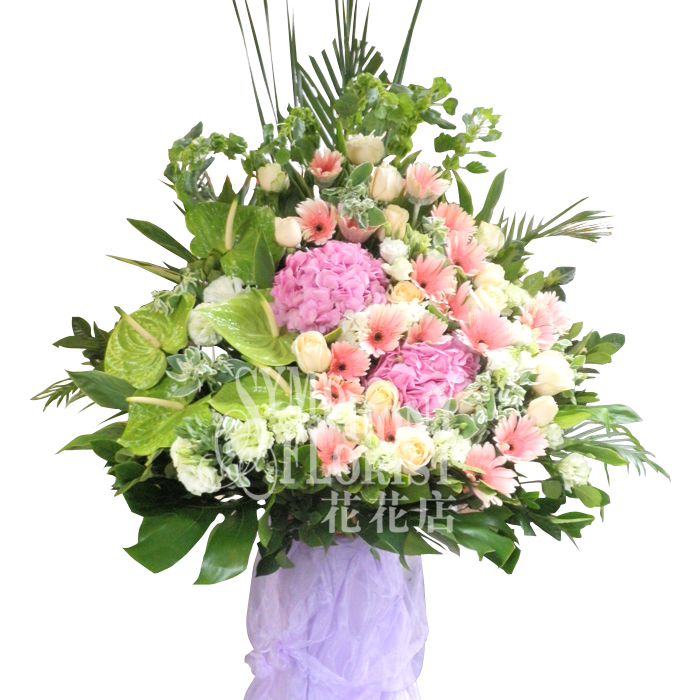 Description: Phalaenopsis, Hydranges, Casablanca, Eustoma & Greenery. 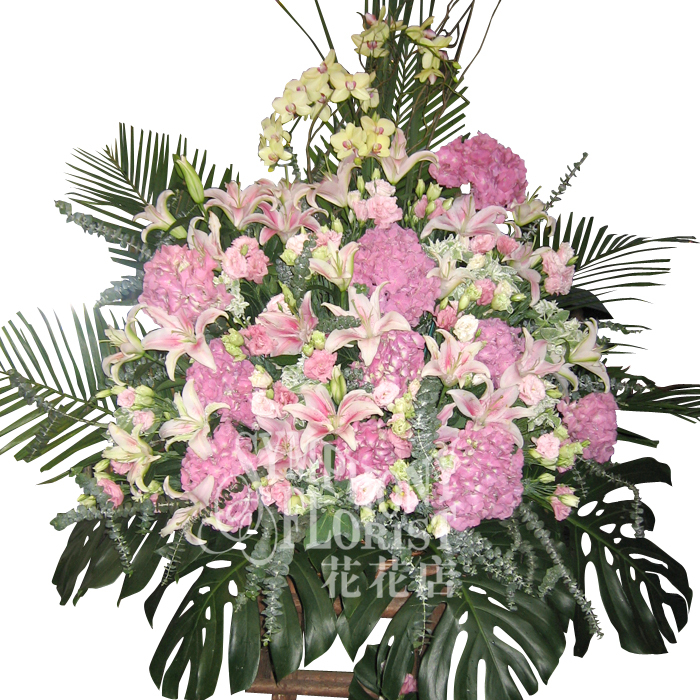 H"190cm, W"160cm. 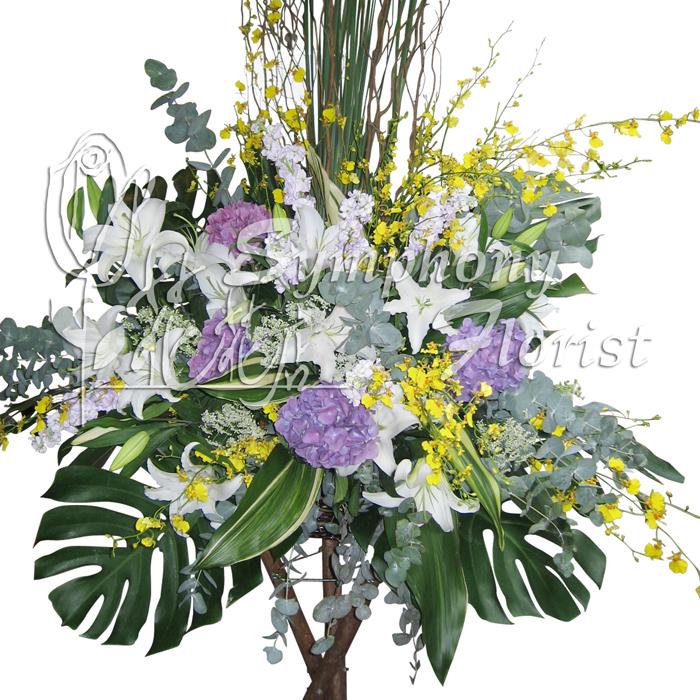 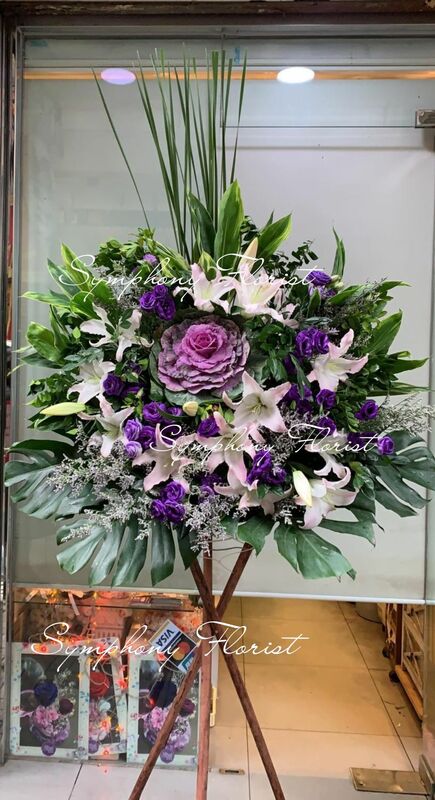 Description: Phalaenopsis, Hydranges, Casablanca, Eustoma, Eucalyptus & Greenery. 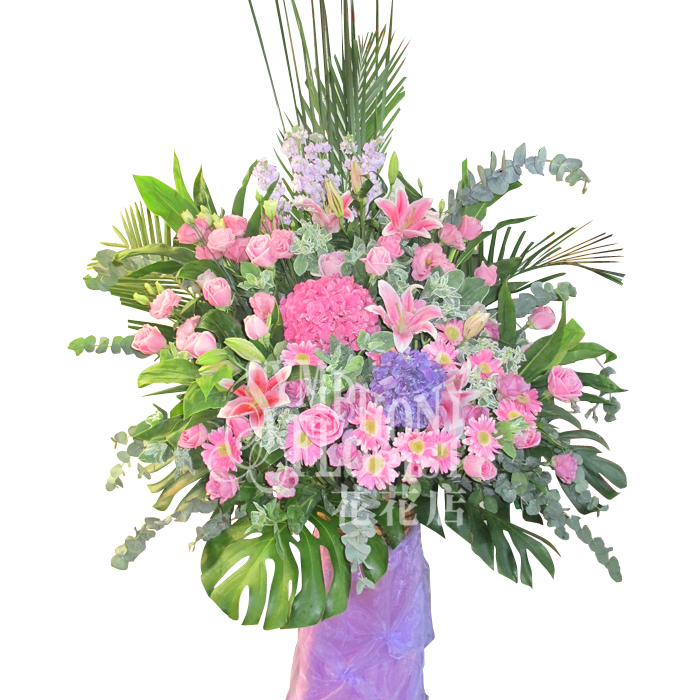 H"200cm, W"160cm. 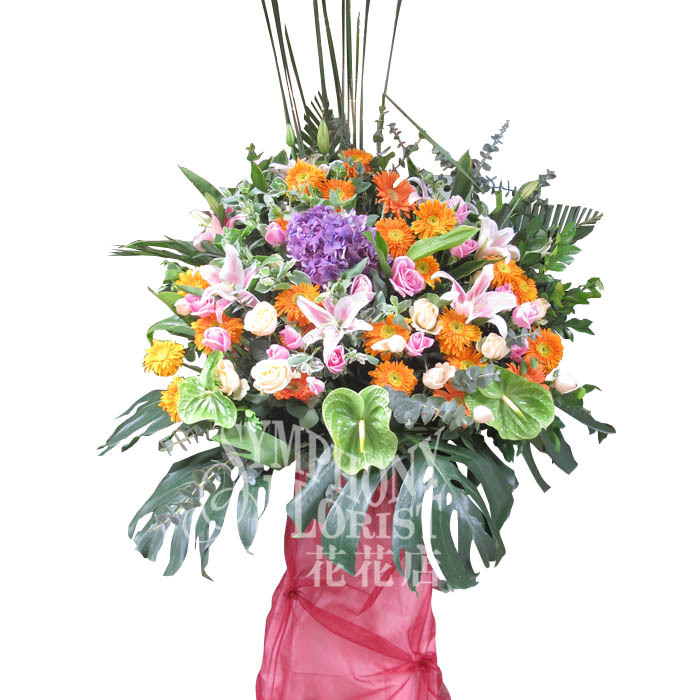 Description: Double Stand Flower Basket. 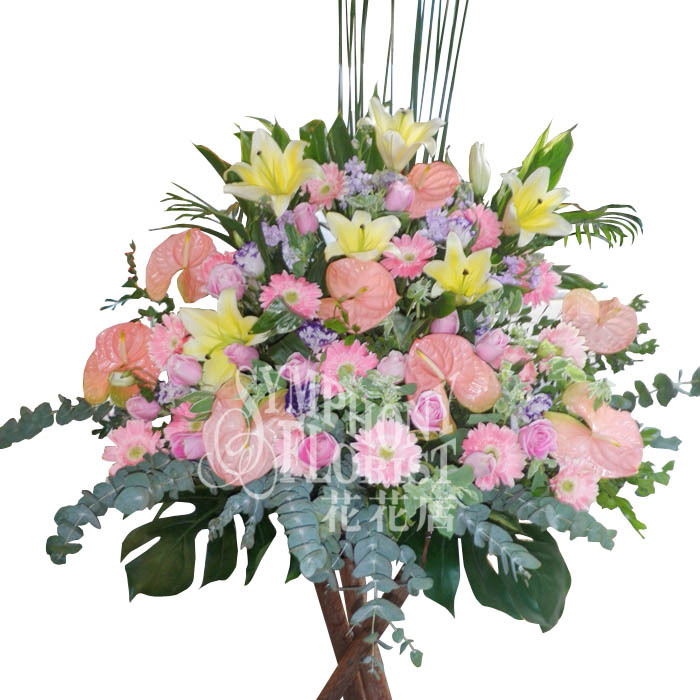 Green Anthurium, Hydranges, Pink Lily, Red Gerbera, Pink & Champange Roses, Eustoma, Euphorbia, Eucalyptus & Greenery. 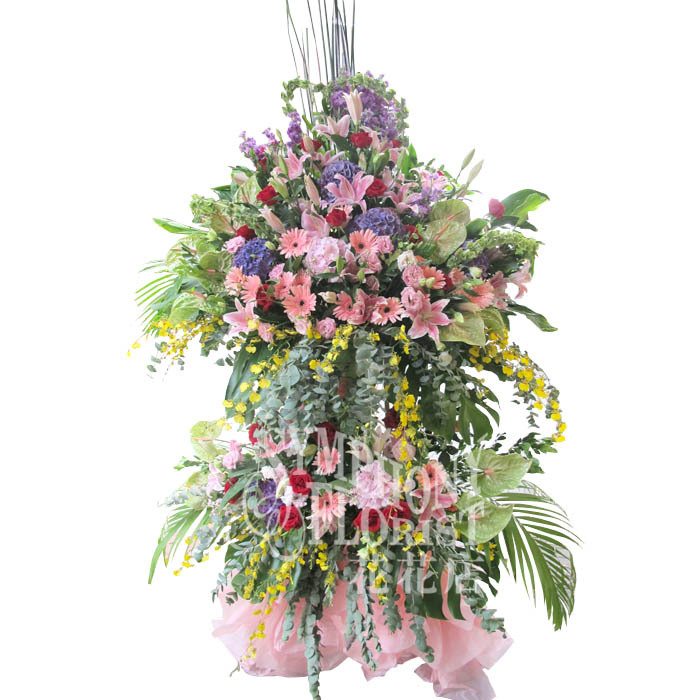 H"210cm, W"160cm. 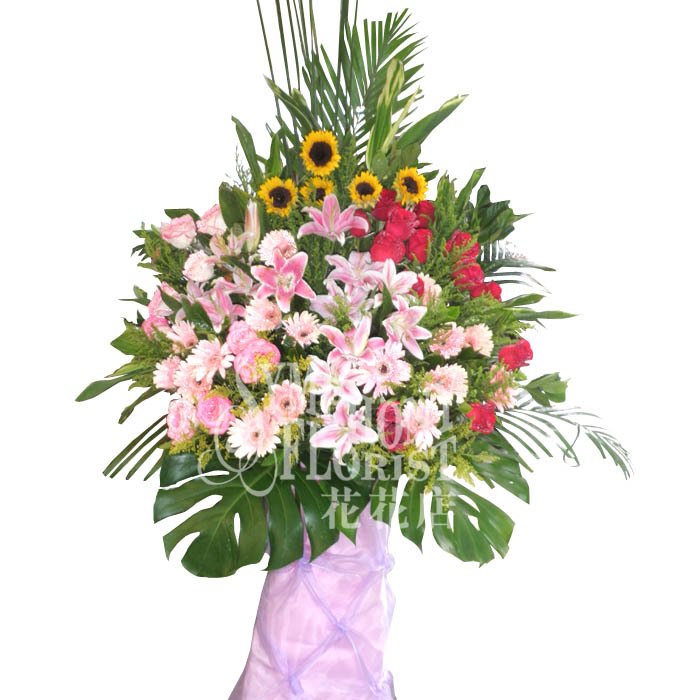 Description: Eremurus, Cymbidium, Dancing Orchid, Hydranges, Pink Anthurium, Pink Lily, Hot Pink Gerbera, Champange Roses, Hypericum & Greenery. 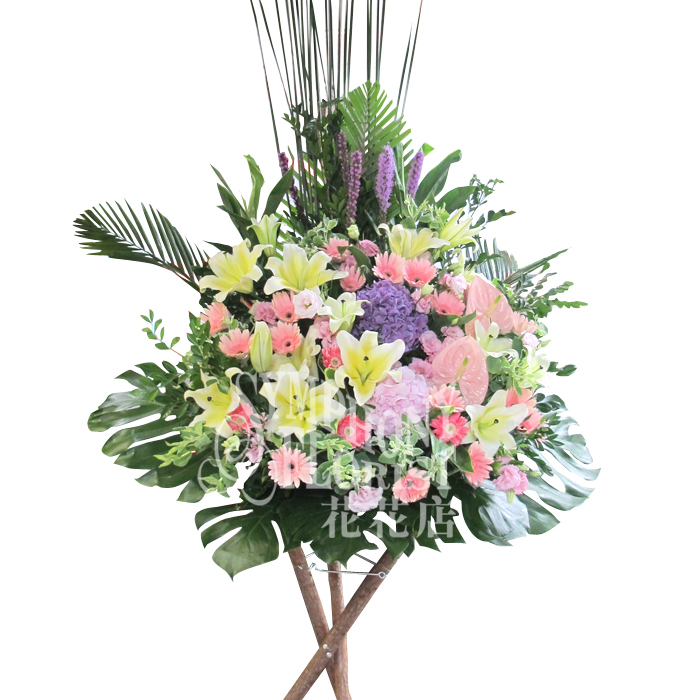 H"220cm, W"160cm. 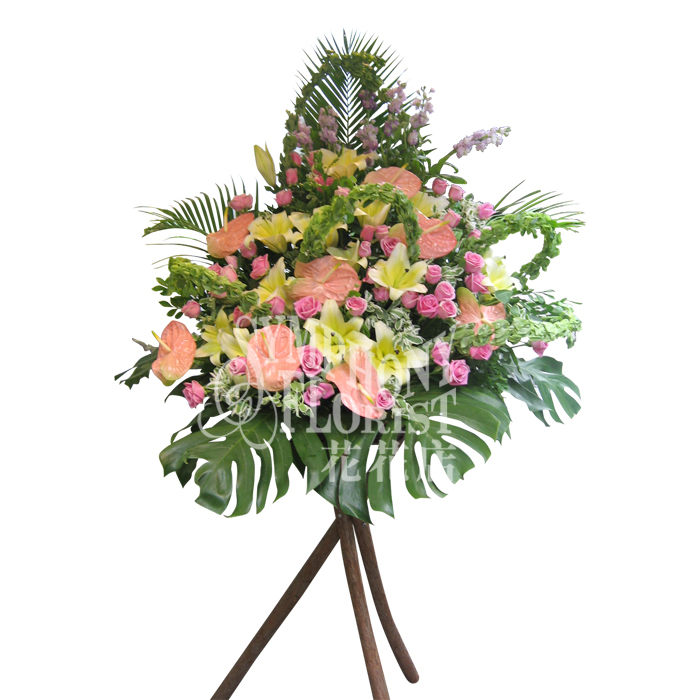 Description: Double Stand Flower Basket. 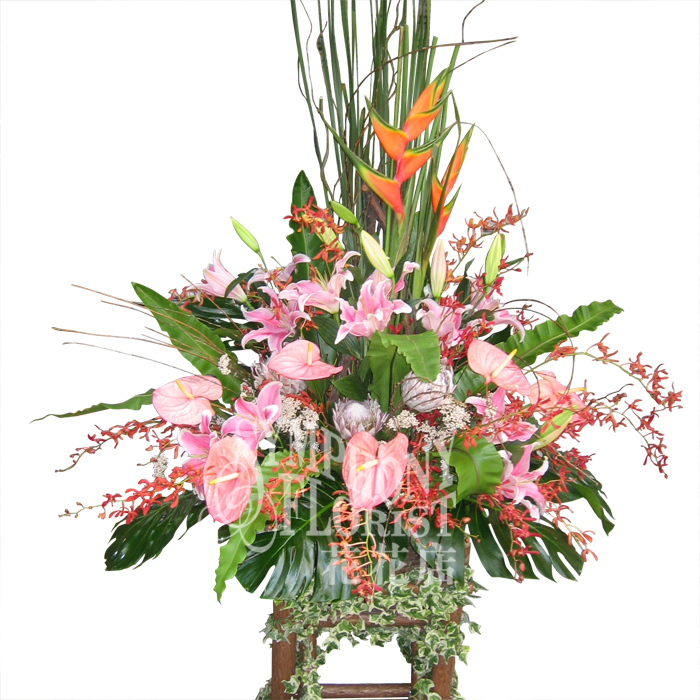 Hydranges, Anthurium, Pink Gerbera, Red Roses, Eucalyputs & Greenery. 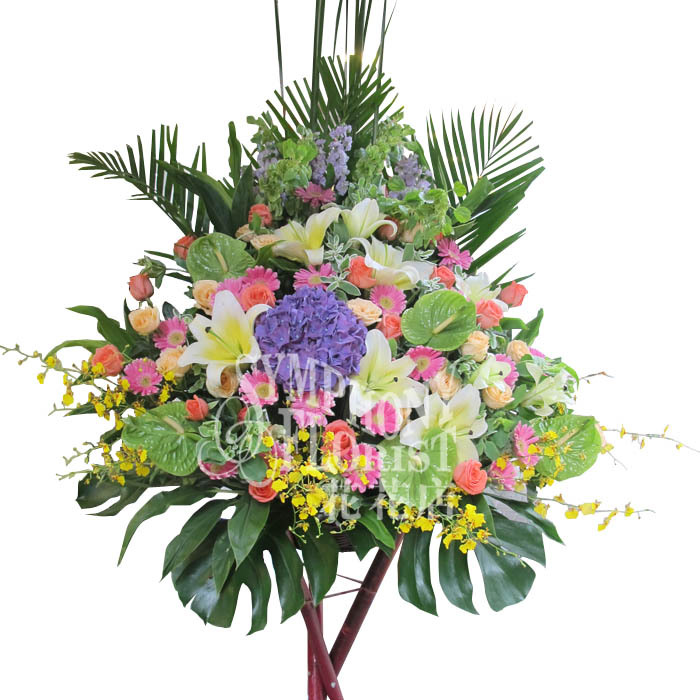 H"220cm, W"160cm.